Day 01: Arrival in Kathmandu Upon your arrival in Kathmandu / warm welcome / transfer hotel / introductory briefing / evening meal in a traditional Nepalese restaurant. Day 02: Kathmandu sightseeing most of the day is spent visiting the important historical and cultural sights of Kathmandu / late afternoon we meet up for trek preparation and introduction with the Nepali support team / this will be followed by an evening meal. Day 03: Fly to Lukla We meet other group members who will be joining us after flying in from Kathmandu.Time for relaxation and preparation for the journey to come. As the starting point for one of Nepal’s most popular trekking routes, Lukla is one of the most important places in Nepal. The airstrip is named after Sir Edmund and it serves as the focal point for trekking throughout the region. Day 04: Lukla to Phakding From Lukla we travel north through the bustling village, before the trail drops steeply to begin with and then more gently to an intersection at Chablung. We cross a stream, through a forest and yet another steep descent to the Kusumkangru Khola. We now know we are truly in Sherpa country as we need to negotiate the trail with the traditional beasts of burden, yaks. After crossing a bridge, the trail climbs slightly, then contours around a ridge to Ghat at 2550m, on the banks of the Dudhkoshi river. We cross a ridge and climb slightly above the river, before descending a steep stone staircase to the first camp site we come to in Phakding. Day 06: Rest day Namche village perched on crescent shaped mountain slopes that offer stunning views of the mountains across the valley. It is a steep 3 to 4 hour climb up from the river to Namche, at 3,500 metres.We spend two nights in Namche for aclimatisation, there are possibilities of side treks up and back from the village which will help with acclimatisation. Traditionally the village was a trading post, with locals bartering yak cheese and butter for agricultural goods grown at lower altitudes. However, after Sir Edmund Hillary and Tenzing Norgay’s successful climb of Everest in 1953, the dynamics of the village changed forever as climbers and trekkers soon followed in their wake. Nowadays it is a thriving Bazzar selling anything from meat and spices, to trekking gear and Chinese trinkits. Day 07: Namche Bazaar to Tyangboche The trail today is fairly level to begin with. We wind around a hill before a steep one hour climb to the Syangboche airstrip 3720m which serves the Hotel Everest view a Japenese funded hotel. From the hotel the trail descends to the village of Khumjung where Sir Edmund Hillary built his original school (make a brief call at the school). From Khumjung we travel westwards down the valley, there are many Mani stone walls and Chortens along the way. We continue on to reach the banks of Dudhkoshi at 3250m. There is then a two hour steep climb to Tyangboche monastery at 3867m. From the monastery there are spectacular views of Himalayan peaks all around including Everest, Nupse, Lhotse and the extremely beautiful mountain of Amadablam. We travel on for a while before reaching our camp. Day 08: Tyangboche to Dingboche From Tyangboche there is a short descent to Deboche through birch, conifer and rhododendron forest. The trail levels out and passes many Mani walls in deep rhododendron forest. After crossing the Imja Khola on a steel bridge, we travel on past some magnificently carved Mani walls to Pangboche 3860m. We continue on through alpine meadows.The vegetation is sparse as we pass several yaks herders settlements before an ascent to a shelf above the river to Orsho. From Orsho the trail divides into an upper and lower trail, we take the lower trail, we are now close to Dingboche where we overnight. Day 09: Rest Day Dingboche is a popular stop for trekkers and climbers, we need to spend two nights in Dingboche for acclimatisation purposes.The village relies heavily on tourists with lodges and tenting areas making up most of Dingboche. The Imja River flows directly east of the village.A helicopter landing pad is located just west of the Imja River.Dingboche is home to an Internet cafe (using satellite technology) and one of the world’s highest billiard parlors. side of the valley to the village of Lobuche where we make camp. Day 11: Lobuche to Gorakhshep The first section of the trail follows the western side of the broad Khumbu valley. We gently ascend through meadows besides the glacial moraine. The ascent becomes more difficult although the trail is well laid out. The trail becomes steeper and rougher as it crosses several side moraines. The day as a whole is not a difficult one and we should reach Gorakhshep 5160m by lunch time. Day 12: Gorakhshep to Everest Base Camp the journey to Everest Base Camp takes about three hours. For those people who want to climb Kalapatthar Kalapatthar (5545m),( a black rock where there are the best views of Mt. Everest) they will leave the trail for a two-hour journey up and back, the rest of the group will continue on to make the final ascent to Everest Base Camp.The rest of the day is spent celebrating and in remembrance with other trekkers and climbers and other Hillary well wishers. Sir Edmund said afterwards “We didn’t know if it was humanly possible to reach the top of Mt. Everest. And even using oxygen as we were, if we did get to the top, we weren’t at all sure whether we wouldn’t drop dead or something of that nature.” On May 29, 1953,and Nepalese Sherpa, Tenzing Norgay, set foot on the 29,028-foot (8,848-metre) summit of Everest, the highest point on earth. They had succeeded where others had failed, and had survived a journey that has taken the lives of great explorers before them and many since. Day 13: Everest Base Camp to Lobuche, overnight camp. Day 19: Fly back to Kathmandu early / afternoon at leisure / in the evening we join a function to commemorate Sir Edmund Hillary’s achievements. Day 20: Early morning Everest mountain flight / we are up early today to travel to the domestic airport for one of the most spectacular flights in the world, a flight around Everest. We fly in a Beech aircraft with individual viewing seats that provide plenty of space for taking photographs or cam movies. Day 21: Fond farewells from all the Nepali team / transfer to the airport for your onward destination. Day 03: Kathmandu to Jiri by road. Our journey begins by taking a series of Land Cruisers from Kathmandu to Jiri, along the Arniko highway that links Nepal to Tibet. We follow the Indrawati River to its confluence with The Sun Kosi River (river of gold) at Dolalghat.The journey continues over a series of ridges and across rivers. The scenery along the way is stunning with some great distant mountain views. Day 04: Jiri to Shivalaya: The trek begins at the end of Jiri’s main street, the trail winds through forests and passes tiny settlements and through pastureland until the top of a ridge. After crossing the ridge at 2’400mtrs, the trail descends and follows a stream that eventually leads into a main valley where, after crossing a suspension bridge, we arrive at Shivalaya / camp 1. for the night. Day 05: Shivalaya to Bhandar Today we start by following a small stream, before a steep ascent to Sangbadanda at 2150mtrs.It is around about here that we begin to get some hint of Sherpa and Buddhist culture with our first sighting of prayer walls (stone walls carved with Buddhist scriptures). From here the trail climbs but less steeply, then levels off over a few streams and up to the pass at 2705mtrs. From the pass there is a sweeping view of the Likhu Khola Valley and below us lies the settlement of Bhandar where we make camp 2. Day 06: Bhandar to Kenja The trail descends down to the lower field of the village. It continues to descend through deep forest and then drops into a steep canyon, we pass the settlement of Baranda and on to Tharo Khola. We then travel north, following the Likhu khola, crossing the river on a suspension bridge to continue up the east bank of the river to Kenja (a small village inhabited by Newars and Magars). We make camp 3 here. Day 07: Kenja to Sagar After leaving Kenja, we begin our ascent towards the high Lamjura ridge. The first part of the ascent is very steep but it becomes less severe as we ascend. After around two hours, the trail divides; we follow the left fork that leads to the north and traverses the hillside to the Sherpa settlement of Sagar. Tonight we will be camping in the yard of one Sir Edmund Hillary’s schools. We are now truly in Sherpa country. Day 08: Sagar to Junbesi From Sagar it’s a long but fairly gradual climb most of the way, through mountain and forests of rhododendron, magnolia, maple and birch, to the top of the Lamjura pass, 3530m. The pass is the highest point on the trek between Jiri and Namche Bazaar. From the top of the pass we trek down through fir and hemlock forest and continue on to our overnight stop at the settlement of Junbesi. Day 09: Junbesi to Nunthala Back on the trail to Nunthala today / just below Junbesi the trail crosses the Junbesi Khola (river) on a wooden bridge at 2640m. Soon after the bridge, the trail forks, we take left hand trail uphill and high onto a ridge 3080m. From here we get our first distant view of Mt. Everest. The trail turns north as we descend through Salung 2980m and on down to the Ringmo Khola 2650m. After Ringmo we climb up, past two splendid Mani walls (prayer walls) and continue the ascent to the Trakshindo pass 3071m. From the pass we trek down through colourful rhododendron forest and accross several crystal clear streams, to finally arrive at our overnight camp at Nunthala. Day 11: Kharikhola Bazaar to Lukla We leave Kharikhola and travel down to cross a stream, before a steep climb to Bupsa 2300m. The trail then climbs more gently through forest up to a ridge at 2900m. The trail up to the ridge provides some splendid canyon views along with the river 1000m below us. From the top of the ridge we drop down into another deep canyon and continue on to Puyan. From here the trail climbs for about an hour, then up to another ridge before descending to Surkhe 2293m. From Surkhe there is a stone staircase to the right that leads to Lukla 2800m. Lukla will be our base for two nights as we await other members who are flying in from Kathmandu. Day 12: Rest Day Lukla We meet other group members who will be joining us after flying in from Kathmandu.Time for relaxation and preparation for the journey to come. As the starting point for one of Nepal’s most popular trekking routes, Lukla is one of the most important places in Nepal. The airstrip is named after Sir Edmund and it serves as the focal point for trekking throughout the region. Day 13: Lukla to Phakding From Lukla we travel north through the bustling village, before the trail drops steeply to begin with and then more gently to an intersection at Chablung. We cross a stream, through a forest and yet another steep descent to the Kusumkangru Khola. We now know we are truly in Sherpa country as we need to negotiate the trail with the traditional beasts of burden, yaks. After crossing a bridge, the trail climbs slightly, then contours around a ridge to Ghat at 2550m, on the banks of the Dudhkoshi river. We cross a ridge and climb slightly above the river, before descending a steep stone staircase to the first camp site we come to in Phakding. Day 15: Rest day Namche village perched on crescent shaped mountain slopes that offer stunning views of the mountains across the valley. It is a steep 3 to 4 hour climb up from the river to Namche, at 3,500 metres.We spend two nights in Namche for aclimatisation, there are possibilities of side treks up and back from the village which will help with acclimatisation. Traditionally the village was a trading post, with locals bartering yak cheese and butter for agricultural goods grown at lower altitudes. However, after Sir Edmund Hillary and Tenzing Norgay’s successful climb of Everest in 1953, the dynamics of the village changed forever as climbers and trekkers soon followed in their wake. Nowadays it is a thriving Bazzar selling anything from meat and spices, to trekking gear and Chinese trinkits. Day 16: Namche Bazaar to Tyangboche The trail today is fairly level to begin with. We wind around a hill before a steep one hour climb to the Syangboche airstrip 3720m which serves the Hotel Everest view a Japenese funded hotel. From the hotel the trail descends to the village of Khumjung where Sir Edmund Hillary built his original school (make a brief call at the school). From Khumjung we travel westwards down the valley, there are many Mani stone walls and Chortens along the way. We continue on to reach the banks of Dudhkoshi at 3250m. There is then a two hour steep climb to Tyangboche monastery at 3867m. From the monastery there are spectacular views of Himalayan peaks all around including Everest, Nupse, Lhotse and the extremely beautiful mountain of Amadablam. We travel on for a while before reaching our camp. Day 17: Tyangboche to Dingboche From Tyangboche there is a short descent to Deboche through birch, conifer and rhododendron forest. The trail levels out and passes many Mani walls in deep rhododendron forest. After crossing the Imja Khola on a steel bridge, we travel on past some magnificently carved Mani walls to Pangboche 3860m. We continue on through alpine meadows.The vegetation is sparse as we pass several yaks herders settlements before an ascent to a shelf above the river to Orsho. From Orsho the trail divides into an upper and lower trail, we take the lower trail, we are now close to Dingboche where we overnight. Day 18: Rest Day Dingboche is a popular stop for trekkers and climbers, we need to spend two nights in Dingboche for acclimatisation purposes.The village relies heavily on tourists with lodges and tenting areas making up most of Dingboche. The Imja River flows directly east of the village.A helicopter landing pad is located just west of the Imja River.Dingboche is home to an Internet cafe (using satellite technology) and one of the world’s highest billiard parlors. Day 20: Lobuche to Gorakhshep The first section of the trail follows the western side of the broad Khumbu valley. We gently ascend through meadows besides the glacial moraine. The ascent becomes more difficult although the trail is well laid out. The trail becomes steeper and rougher as it crosses several side moraines. The day as a whole is not a difficult one and we should reach Gorakhshep 5160m by lunch time. Day 21: Gorakhshep to Everest Base Camp the journey to Everest Base Camp takes about three hours. For those people who want to climb Kalapatthar Kalapatthar (5545m),( a black rock where there are the best views of Mt. Everest) they will leave the trail for a two-hour journey up and back, the rest of the group will continue on to make the final ascent to Everest Base Camp.The rest of the day is spent celebrating and in remembrance with other trekkers and climbers and other Hillary well wishers. Sir Edmund said afterwards “We didn’t know if it was humanly possible to reach the top of Mt. Everest. 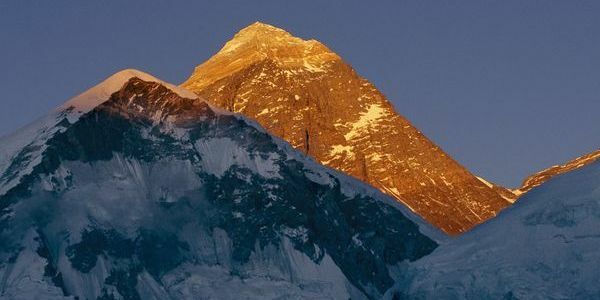 And even using oxygen as we were, if we did get to the top, we weren’t at all sure whether we wouldn’t drop dead or something of that nature.” On May 29, 1953,and Nepalese Sherpa, Tenzing Norgay, set foot on the 29,028-foot (8,848-metre) summit of Everest, the highest point on earth. They had succeeded where others had failed, and had survived a journey that has taken the lives of great explorers before them and many since. Day 22: Everest Base Camp to Lobuche, overnight camp. Day 28: Fly back to Kathmandu early / afternoon at leisure / in the evening we join a function to commemorate Sir Edmund Hillary’s achievements. Day 29: Early morning Everest mountain flight / we are up early today to travel to the domestic airport for one of the most spectacular flights in the world, a flight around Everest. We fly in a Beech aircraft with individual viewing seats that provide plenty of space for taking photographs or cam movies. Day 30: Fond farewells from all the Nepali team / transfer to the airport for your onward destination.